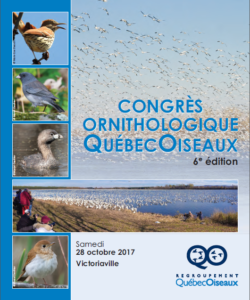 Last weekend I had the pleasure of giving a 20-minute talk at the Congrès Québec Oiseaux 2017 in Victoriaville, Québec. 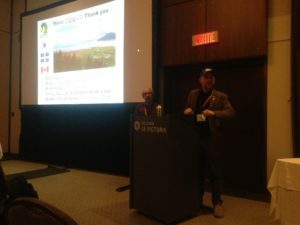 The talk, which was given in (rusty) French, started with a sketch of what it’s like to live and bird in Korea, followed by a look at the work Birds Korea does, and some of the conservation challenges, both large and small, that confront Korea’s natural realm. Large-scale destructive projects like Saemangeum and Four Rivers were explained, as well as the smaller scale threats faced by Korean birds and their habitat. I used several personal anecdotes to paint the picture in an engaging manner. Aside from the nerve-wracking aspect of giving such a speech in French, the rest of the day was quite pleasant, as I got to compare notes with other participants. Throughout the day I fielded questions about the birding and conservation scene in Korea, which most folks there knew very little about. The process of putting together the presentation reminded me how incredible and dynamic (if heartbreaking at times) it was to be a birder in South Korea, and of course all the amazing times I had with other members of Birds Korea. Hopefully I can return in the new year, to have a fresh set of birding adventures with my friends in Korea. A big thank you to Nial Moores, for allowing me to use images/data/graphs produced by Birds Korea, and to Tim Edelsten and Robin Newlin for letting me use their images of grim habitat destruction and the bird species it impacts. Hey Matt, French is one of the easiest language to read but hardest to give a speech in so kudos to you. It was rewarding to let more people know about the challenges faced by birds and their habitat in Korea, and about the important work being done by Birds Korea.